Most of us want to Make Money Online in our part time or even full time. Especially those, who have to stay at Home; for example Moms, Seniors and even who are laid off from their Jobs, they can spend their free time to Make some extra Cash. Yes, you can make Money with Affiliate Marketing Program and this I can say with my own experience. As I am Making Money with my Ease Bedding Blog, which sells Amazon Products and is making around $ 700 monthly by the time of writing this post, dated May 14, 2017 and I hope it is going to grow more in future. Sometimes we read advertisements, ‘Make Money just by Joining Our Program or by doing very little work‘. Why to spend months on Creating your own and thousands to get the ball rolling, when there is easy Way to Join an Affiliate Program, grab your Unique ID and promote it right away. You can make happen your first Sale within few days, not even Weeks. In the Beginning when your Blog is New and when you’re not getting Traffic from Search Engines, you can spend some time writing Useful Comments and you can get some Free Traffic. Actually you as a Publisher, will be Rewarded when you help a Business by promoting their Products or Services. For example, if you Sign Up for ‘Amazon Associate Program‘ and Promote its Products according to your own Choice by seeing the Nature of your Website/Blog and you will get a Commission, when you send the Visitor from your Site, makes a Purchase or Buy something from Amazon. Affiliate Marketing can be done Part time/Full time and many are so Successful to Make Money with it. As I am Home maker and I started it from filling Surveys, where I didn’t Make Money at all. Then I signed up with Max Bounty and almost worked with them for a year and that time, I learned about Affiliate Marketing. There are Two Ways to Start your own Blog and to learn more about starting your own Blog, GO HERE and read it thoroughly, then follow the Steps and start your Blog. If you want to Decorate your Bedroom or want to Buy any type of Bedding Sets, Comforters, Quilts, Blankets, Pillow Shams, Window Curtains/Drapes, you can Check my Blog Ease Bedding. As until now by the time of writing this article, June 9, 2019 Amazon is my alone one Source of Income from my Ease Bedding Blog and now I’m planning to start some more Ways and on this BLOG, which is just New, I’m going to use different Ways to Earn Money from Blogging. These days most of Online Companies, who Sell Products; such as Bedding Sets, Handbags, Hosting and so many other Products, there is very much possibility that they can Offer an Affiliate Program, such as SiteGround, is very popular Hosting Company and my Two Blogs – Ease Bedding and Recipes with More are hosting with them. Start your BLOG NOW with SiteGround today! Starting a Successful Niche Site is all about Picking the Right Keywords so that it can Rank in the Search Engines! The Best thing about Niche Affiliate Site is that, you can Run it from anywhere. And there is no Inventory and Customer Service is involved to Run Niche Affiliate Sites. As I am promoting Bedding sets, Comforters, Quilts, Blankets, Pillow Shams in my Ease Bedding Blog and on Recipes with More Blog, I am promoting SiteGround Hosting Products and many more Products on very Affordable Prices! How to Sign Up for Amazon Affiliate Program? Steps are give below, please read them carefully and if you’re willing to Join, then follow all these Steps. 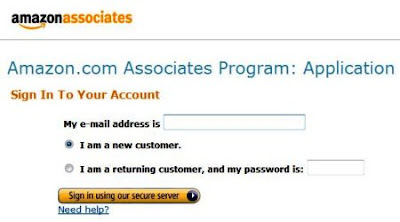 To apply for the Amazon Associate Program, you’ll need a Website or Blog. When you are going to apply for the Program, you also have to explain what your website is about, other Advertising or Affiliate Listings on your Site and who your Target Audiences are. So Learn to Make your own Blog now! Pay Per Sale: In this Program, the Merchant pays to the percentage of the Sale Price, when the Purchase is Completed Successfully. Means in Online Advertising Payment Model, which is based Solely on Qualifying Sales. Pay Per Lead: In this Program, you get Paid once the Referred Visitor provides his/her Contact Information on the Target Site by Filling Out a Simple Contact form. With Max-bounty, I used to promote their couple of Survey Programs and when the Visitor used to fill the form, then I used to make the Commission from them. Means in Pay Per Lead Program, the Advertiser only Pays for Leads Generated at their Destination Site. No Payment is made for visitors that don’t Sign Up. Benefits of Using Affiliate Marketing! Creating your own Product or Service takes a lot of time, Money and Skills to Make happen everything right. But Making Money with Affiliate Marketing is easy and fast, because you don’t have to Create your own Product. One of the best reason to Make Money with Affiliate Marketing is that, there is almost Zero risk to you or the Company you want to Sell for. You’re not Required to Commit to anything and you’ll never have to Pay for Products upfront. To Promote Affiliate Marketing Products, you don’t have to provide Customer Service. For example if you’re using Amazon Products, they will provide Service, but not you. With Affiliate Marketing all Customer Work is handled by them, so you’re free to do your work. To promote Affiliate Marketing, you don’t have to have Office or Employees. Affiliate Marketers don’t have to worry about this. There is no Payment of Affiliates unless they refer a Visitor, who subsequently becomes a Customer. So there is no wasting of Money in Affiliate Marketing. The Affiliate Marketing Program, which is my favorite, provides an Easy way to Create Additional Sources of Income for Blogs Publishers and owners. Marketing Banners of Merchants Products generate instant Sales, wherein they get a Commission. An Affiliate Marketer can enjoy the luxury of being his own Boss and Work on his own time. I love this aspect of Affiliate Marketing. The best part of Affiliate Marketing is that, you can Make Money 24/7, because Publishers’ Website is not a Physical store or Business, so it has almost no Restrictions. There are no employee Costs and the Business is open 24/7. Visitors may visit Publisher’s’ Website during Night time, means while Publisher is Sleeping.